The world is flat. Any fool can tell you that. Of course, long ago, the fools of a past age thought it was flat like a shining coin, soaring through the void with its three luminous moons like some mad god's lost change. The discovery of a bunch of elephants and a planet-sized turtle adhered to the other side of the "Coin" kind of upset this theory, but sadly, by then, the name had stuck. 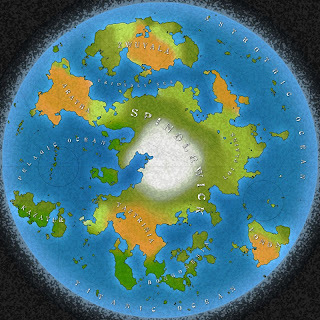 So, this is my campaign world. A little Discworld*, a little D&D kitchen sink, far more planning than is healthy, and far less planning than it seems to warrant. The map above was originally created by TheLoneAmigo, then got tweaked by me (you can blame me for the horrible shade of orange on the deserts, him for the place names). *which is to say, a lot Discworld.